I am grateful to Martin Heeley, a PGCE student at York University for reminding me about how useful checklists can be in improving students' performance on tasks and I shall use an example of his below to demonstrate the point. I would then say that in the next five minutes, the "candidate" had to incorporate somehow each of those expressions into their conversation. This would become a source of challenge and amusement, focus minds a bit more and gradually the expressions would become handy elements to be used in the future. Individual students would take pleasure in deliberately overusing certain phrases for comic effect. Needless to say, such expressions become handy comfort blankets in the actual exam. Five minutes later I would alter the list to widen the students' range of expression, perhaps giving my own examples of how the formulae could be used. We know what happens when you adopt this approach. Just as in the A-level example, students latch on to these lifebuoys and use them in subsequent work, gradually increasing their repertoire of language. This is another writing example at a post beginner/very low intermediate level. I like the fact that this type of checklist makes pupils reflect on what it takes to write interesting and varied language. They do a lot of this type of thing in English lessons and it really helps pupils who are genuinely not sure what to write. As examination boards move back to linear papers and away from controlled assessment, students will need an armoury of phrases and little techniques to help them write and speak under pressure. Teachers would do well to make good use of checklists. Thanks for commenting. 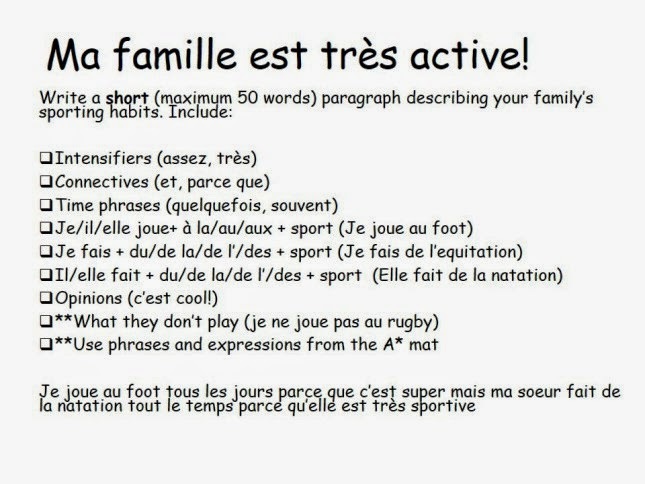 I have added your blog to my blog roll on frenchteacher.net.